WHEN researchers in South Africa put GPS collars on 14 female African elephants in Kruger National Park they intended to study the relation between the movement of the animal and its environment. What they figured out was much more interesting and can change the way research on animals and ecology is carried out. They found there is an abrupt change in elephant movement at the end of wet and dry seasons. The study found the animals increased their speed during the wet season till the onset of the dry season, when their speed decreased. It picked up once again as the wet season started. This change in movement, they inferred, is controlled by the availability of food. During dry seasons, movement of elephants and other herbivores is restricted as both quality and quantity of food is reduced. This results in lower nutrition and the animal tends to conserve energy by restricting its movement. But the restriction ends with the start of the wet season. The researchers at the Amarula Elephant Research Programme at the University of Kwazulu-Natal say the findings are important. Understanding the movement of the animal has helped them ascertain how they are responding to seasonal changes like rainfall in real time. This helps characterise seasons from the perspective of the animal instead of arbitrary climate variables. Traditionally, seasons are defined based on average climatic variables such as temperature, rainfall or snowfall. They could also be based on calendar months. For example, wet season in a savanna system in Southern hemisphere is supposed to fall between October and March. These are then used for various management interventions, like opening up of water holes during dry months in areas where animals are water-stressed and decisions related to controlled burning of forests. For accurate animal management interventions, knowing when the correct seasonal shift occurs is important. If one assumes a generic break, one may make ecological interpretations that are incorrect and implement an intervention at the wrong time, says Abi T Vanak, who was part of the study and is now working at ATREE, a research organisation in Bengaluru. This could have negative effects on the animals. 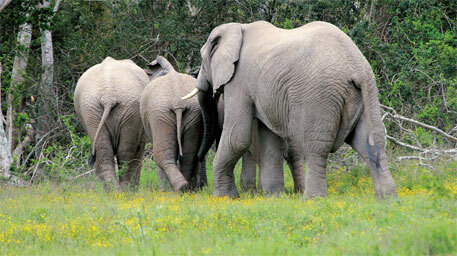 For example, elephants and other large herbivores are food-stressed at the end of the dry season. It would be better to wait till they have responded to fresh nutrition at the end of the dry season, prior to capturing and shifting animals to other sanctuaries. “Though our emphasis was on elephant’s response to its environment, the findings can also help protect the species and understand critical aspects of habitat use,” Vanak adds. “We recommend the use of such methods for delineating seasons or other extrinsic shifts in ecological studies, rather than arbitrarily fixed definitions based on convention or common practice,” says Patricia J Birkett who is the lead author of the study published in the June issue of PLoS One. The study also gains importance considering that climate change keeps altering the man-made classification of seasons. “This study shows how you can use a readily available technology (GPS collars) to actually see how the animal is responding to environmental change directly, instead of having to forecast from past findings, based on assumptions that may not in fact hold under climate change,” says Clive G Jones, ecologist at Cary Institute of Ecosystem Studies in New York. He cautions that the recognition that organisms respond to the environment does not necessarily mean that this understanding can be used to predict how these species will respond to future environmental change. “To do that we need to know what cues the animal is using from the environment,” says Jones.